I've posted on leaf blowers before, but this deserves repeating. One of the most useful pieces of equipment for prescribed burns is a heavy duty leaf blower. We have two and use them on every burn. When we started doing prescribed burns about 20 years ago, the main tool to build a fire break was a hand rake. It’s hard for me to realize how primitive that was. To get a clean fire break it took a line of rakers, each following the one in front. This took a lot of time and three or four people. No wonder our burn units were so small! After doing a primitive Internet search (no Google in those days! ), I ran across a page where someone recommended using a leaf blower. For our third year of burns we rented a leaf blower, and never went back to a rake again. The following year we bought the largest leaf blower we could afford. I’m not talking about those tiny leaf blowers that home owners use to clean their sidewalks. I mean a large, heavy duty leaf blower that pushes a lot of air. What is called a “Professional Blower”, the kind sold to landscaping professionals. 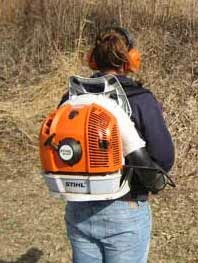 The air velocity spec of the big Stihl leaf blowers ranges from 180 to 200 mph! Ours (Models 500 and 550) have what is called an Easy/Start feature. Kathie says the blower should be powerful enough so that when you put it on full pressure you feel like you are getting ready to “take off” backwards! Some blowers have noise-reduction features but these are not necessary for use in rural areas. A good pair of ear muffs is fine. Example of what a leaf blower can do on a fire break. This break is mowed several times during the growing season, and again just before the burn. Then a couple of passes with the leaf blower finishes the job. No danger of “creep” out of the burn unit! Photo from October 2014 oak woods burn. Some people use a motorized lawn mower instead of a leaf blower. A riding lawn mower also works. These are fairly good as the first pass, but aren’t as efficient. Also, they don’t do a good job at the edges of the break. A riding mower was used for the first pass on the fire break shown here, followed up by two passes with the leaf blower (down and back). Not only is a leaf blower essential for creating a good fire break, but it also has other uses on the fire line. It can be used for fire suppression in light fuels, and in mop-up operations, such as blowing smoldering material back into the black of a burn unit. We also use them to "fire-proof" around dead snags and other trees we want to protect. 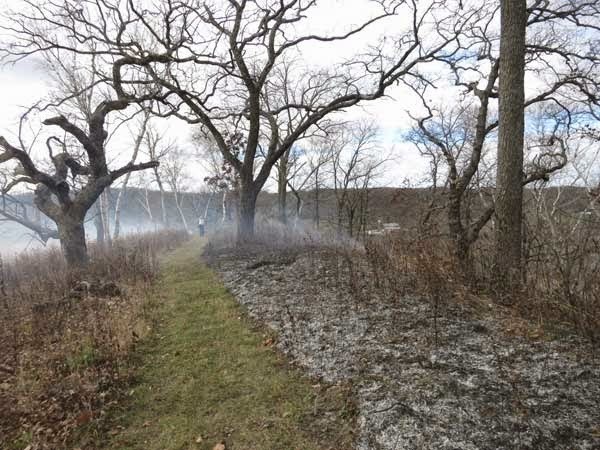 Oak savanna restoration: to seed or not to seed? Oak savanna restoration is a long-term and expensive activity, but the results are worth it. Because it takes so long for a restored savanna to be established, careful long-range planning is essential. Generally, one starts with a fairly degraded (former) savanna, containing numerous open-grown oaks, but heavily crowded with invasive trees such as elm, walnut, maple, box elder, or other fire-sensitive species. Also present are probably invasive shrubs such as buckthorn, honeysuckle, prickly ash, autumn olive, etc. Remove all the invasive trees, paying special attention to those that are crowding open-grown oaks. This step is sometimes called "daylighting the oaks." At the same time, cut and treat all invasive shrubs, both native and non-native. Burn the understory either in the spring or fall. Some restorationists stop at this point, perhaps doing annual or biennial burns and waiting for the understory herbaceous vegetation to appear. Whether they realize it or not, those folks are assuming that there is a good "seed bank" still present and as soon as light is allowed in, those species will be "released". With highly degraded oak savannas, it seems unlikely that a complete complement of savanna species seeds will still be present in the soil. Some species may be present, but most will not be. Data from studies on prairies has shown that seeds of many prairie forbs and warm-season grasses, especially, do not persist very long. The main species that persist are hard-seeded types such as sedges and legumes. Since many of the savannas being restored have been degraded for over 50 years, it seems reasonable that the seed bank is greatly impoverished. However, even if a seed bank may exist, why not plant? Experience has shown that it takes 5-10 years to get a good savanna understory established. Let's speed things up. Of course, the species planted should be those that already exist in the area (local genotypes). They will join with those arising from the seed bank, thus increasing the diversity. The only situation where seeding would not be warranted was if the site was part of a research study. Excellent lists of savanna species are available from Brian Pruka, Steve Packard, and Brian Bader, and I have included them in my web site on oak savanna restoration. Many woody plants that are rhizomatous produce dormant buds on their roots that are capable of forming new shoots when apical dominance is eliminated. These new shoots may be called basal shoots, root shoots, or adventitious shoots, but they are most commonly called root suckers. This is a property of asexual growth or vegetative reproduction, and is widespread in woody plants, both shrubs and trees. Although root suckering also occurs in herbaceous plants, it is more commonly a problem in control of woody plants, especially ones known to be invasive. It is often found that when a clone of a root suckering species is cut or burned, more new shoots will arise than were originally present. Even if the cut stems are treated with herbicide, root suckering will occur. In fact, the treatment seems to have stimulated growth. This is because the rhizomes contain large numbers of dormant buds, and many of them are released when apical dominance is removed. Knowledge that a woody species root suckers is very valuable in developing a control strategy. It is a key that the "patch" cannot be eradicated by simply cutting and treating. You can be certain that within a month or so, or the following season, root suckers will have grown and must be dealt with. Since root suckers themselves are capable of forming rhizomes and shoot buds capable of forming new root suckers, it is essential that the suckers are killed before they have a chance to do anything. Thus, if the original patch was cut in spring or early summer, it must be revisited in late summer and all new suckers treated. If the patch had been cut in late summer/early fall, then it must be revisited in early to mid summer of the following year. To eradicate a patch is at least a three-year job, perhaps longer. There is some suggestion that root suckering may not occur if the clone is foliar-sprayed with aqueous triclopyr. However, it is difficult with such foliar spraying to prevent damage to "good" plants. In Nebraska, Stubbendieck and associates adapted a sponge applicator to a tractor and were able to eradicate large sumac clones without any peripheral damage. Aspen is notorious for root suckering. In commercial aspen production, this is considered a "good thing". Access this link for an excellent U.S. Forest Service manual on aspen ecology and management. This will take you to a page with links to PDF files, for individual chapters or the whole manual. The chapter by George Schier et al. on Vegetative Regeneration discusses root suckering and its control by girdling etc. in detail. Although the manual focuses on Western United States, the same species is present in the Midwest, with the same growth characteristics. The principals derived from aspen can be applied to other woody species. The 2015 Midwest Fire Conference at Dubuque, Iowa, is an event important to all landowners in the upper Midwest. This conference has been organized by the Tallgrass Prairie and Oak Savanna Fire Consortium (tposfirescience.org). For restoration and land management, prescribed (controlled) fire is the most effective and economical tool. The triennial Fire Conference provides a great opportunity to meet fire experts and hear them present the latest information on uses of this important tool. A unique feature of the 2015 conference is that volunteers and private landowners can register at half price. Because of Dubuque, Iowa’s location, attendance is easy from Wisconsin, Illinois, and Minnesota. The program and registration information can be found at this link. Kathie and I have been attending these fire conferences since their inception and have benefitted greatly. In addition to listening to the talks and looking at the posters and commercial displays, there is the chance to meet other like-minded people. Of all the conferences dealing with restoration and land management that we have attended, the fire conferences have been the most interesting and most useful. Half-priced registration for volunteers and private landowners makes a lot of sense. 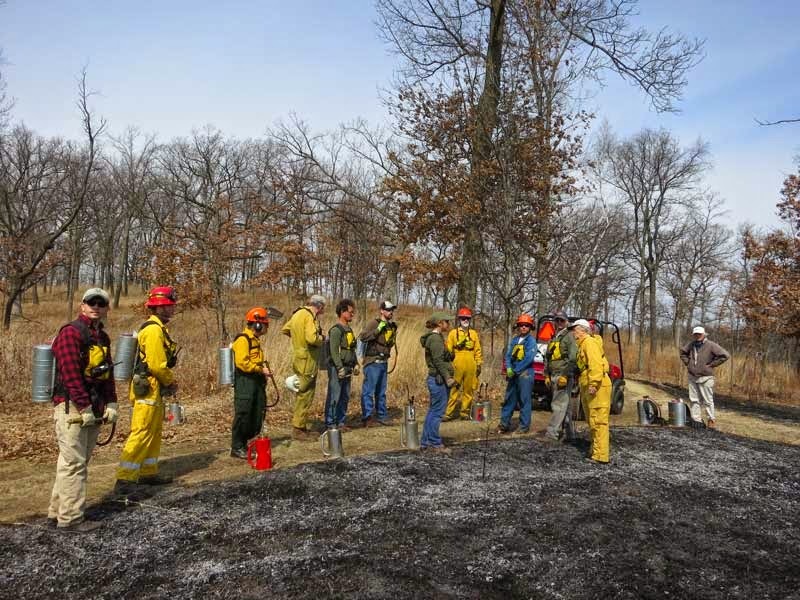 Volunteers play an important role in prescribed fire, especially with conservation societies, and a vast amount of the natural area land in the upper Midwest is owned privately. "Keeping Fire Working for the Land" is an ideal theme. Buckthorn (Rhamnus catharticus) is a calciphile and proliferates primarily in areas where the soil is rich in calcium and magnesium. In the Driftless Area of Wisconsin, soil calcium is derived mainly from underlying dolomitic/limestone bedrock. At Pleasant Valley Conservancy we have some areas with underlying dolomite and other areas with underlying sandstone. Buckthorn infestations are only found in significant amounts in the dolomitic areas. Several years ago I gave a Poster on this at the Prairie Enthusiasts meeting. At Black Earth Rettenmund Prairie buckthorn is only found in a couple of small areas, and I was interested to see the distribution here in relation to bedrock. A few years ago geologists at the Wisconsin Geological and Natural History Survey sent me a GIS-adaptable file of the bedrock geology of Dane County. I used this in ArcMap to plot the distribution of dolomitic rocks. The map here shows the results. There is a thin band (about 20 feet thick) of Black Earth dolomite that is present in two small areas of the prairie and this is where the buckthorn was found. There was no significant buckthorn in either of the sandstone areas. The principal dolomitic rock in Dane County is the Prairie du Chien dolomite, but this is at a higher elevation and is not present at Rettenmund. However, at higher elevations, such as Pleasant Valley Conservancy or Mazomanie Bluff, this is the principal bedrock, and buckthorn is a major problem in those areas. I haven't had time to look at other parts of Dane County, but with the bedrock-GIS file, this should be easy to do. 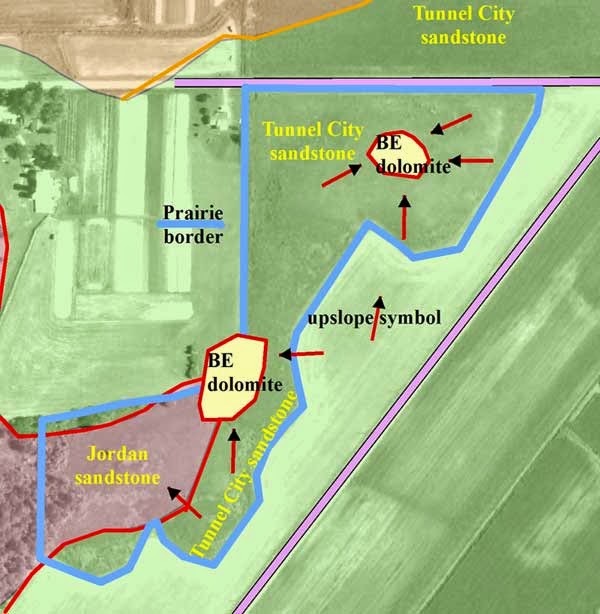 Note that this analysis can only be done in the Driftless Area, where soil is derived primarily from bedrock. In glaciated areas of Dane County, soil calcium/magnesium will depend on the nature of the glacial deposits.